Powers/Abilities: The Pitiful One existed as a walking corpse and could heal from virtually any injury with ease. While he could use the Creme du Profundis clay to return to Earth for 24 hours at a time, he could also return to Hell at will by concentrating on a really degenerate episode from his past. History: (X-Statix Presents: Dead Girl#1 (fb)) - Once a supervillain, the man who would become the Pitiful One fought the Fantastic Four numerous times. (X-Statix Presents: Dead Girl#1 (fb)) - Daredevil and Thor teamed up to defeat the man who became the Pitiful One, who lost a few teeth in the battle. (X-Statix Presents: Dead Girl#4 (fb) - BTS) - During another battle with Daredevil, the man who became the Pitiful One was given a triple hernia. (X-Statix Presents: Dead Girl#1 (fb)) - The man's corpse was found in a garbage can by a young boy named Marlon and his friend Larry. As they discussed what to do with their discovery, the man's corpse was loaded into a garbage truck by two garbagemen. The man soon awoke in Hell and immediately set out to find a mystic clay called Creme du Profundis that he had heard about once before. (X-Statix Presents: Dead Girl#2 (fb) - BTS) - The man eventually decided to start calling himself the Pitiful One, thinking it only fitting for a guy who had been beaten and humiliated so many times by superheroes. (X-Statix Presents: Dead Girl#1) - Years later, upon finding the clay, the Pitiful One gathered a group of deceased superbeings and used the clay to bring them and himself to Earth for 24 hours in an effort to remind the Earth of them. He soon led the group of superbeings in an attack on the United Nations, demanding to see Doctor Strange or they would every delegate of the United Nations. Doctor Strange eventually arrived and spoke with the Pitiful One, who gave his life story. After Strange grew tired of listening to the Pitiful One's bleating, the Pitiful One announced his demands to be fully resurrected like other superbeings such as Colossus, Elektra, and Psylocke. (X-Statix Presents: Dead Girl#2) - The Pitiful One led his group of superbeings into a nearby mall. After they had demolished it, the Pitiful One led them outside where reporters were waiting to film their rampage. Before they could speak however, the mystic clay wore off and the group returned to Hell. Upon their return, the Pitiful One commented to the Anarchist that he once experienced what felt like 200 years of the Thing sticking his head in a toilet while in a deeper level of Hell. He then introduced the group to the Ancient One, who explained that Doctor Strange was now trying to stop their resurrections. The group later returned to Earth once again using the Creme du Profundis and kidnapped Strange's manservant Wong to use as a hostage. (X-Statix Presents: Dead Girl#3) - While the other superbeings under his command fomented chaos across the United States, the Pitiful One confronted the President and warned him (through his rubber ducky, Ducky Wucky) that he could not be stopped. He then returned to the Hotel Simons where the Ancient One and Mysterio were torturing Wong. Upon the Ancient One's suggestion, the Pitiful One brought Wong with them back to Hell where the torture continued until the Ancient One announced that Doctor Strange was also gathering up deceased superbeings to aid him. The Pitiful One then ordered the Anarchist and Miss America to guard the Creme du Profundis while he dispatched Mysterio and Kraven to guard the elevator into Hell. The Pitiful One then aided the Ancient One in torturing Wong until Wong eventually gave them entrance into Strange's Sanctum Sanctorum. (X-Statix Presents: Dead Girl#4) - At the Sanctum Sanctorum, the Pitiful One retrieved Strange's physical body and returned to the Hotel Simons where Wong escaped him. The Pitiful One gave chase to Wong outside onto the fire escape but Wong kicked him in the head, knocking him off the fire escape where he fell and was impaled on the fence below. He then decided to return to Hell and check on Kraven. He arrived in time to see Kraven arguing with the Anarchist about Tike's fling with Miss America. Slapping the Anarchist aside, the Pitiful One reminded Tike that if he wanted to be alive again, then he would halt his advances on Miss America. (X-Statix Presents: Dead Girl#5) - After a long time of waiting for the Ancient One to finish his battle with Doctor Strange, the Pitiful One and the rest of his group were met by the arrival of Dead Girl and the remnants of her group of heroes. A battle soon ensued that resulted in Dead Girl punching out the Pitiful One's internal organs and revealing his identity to those present. While those present were surprised at how low the man known as the Pitiful One had sunk, the Pitiful One began to waste away into a lower level of Hell. Dead Girl announced that he was going to be REALLY sorry for his crimes now. Comments: Created by Peter Milligan, Nick Dragotta, and Mike Allred. The Pitiful One's identity was revealed to the characters present in the final battle against him. Unfortunately, his identity was not revealed to the readers as he was facing off-panel when his identity was discovered. Anyone know a character whom Thor and Daredevil teamed up to fight and once or twice fought the Fantastic Four? I think Doctor Strange is a good candidate...He seems as if he used to be "really big," but then he seemingly disappeared after his one story pretty early in the Modern Era, which could mean that he kept fighting super-heroes but stopped being a headliner, getting eclipsed by Doctor Doom, Doctor Octopus, and others...Plus it's kind of ironic to think that without even realizing it, Doctor Strange and Dead Girl recruited heroes to help fight...Doctor Strange. 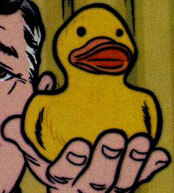 The Pitiful One received an entry in the All-New Official Handbook of the Marvel Universe Update#2. When the Pitiful One confronted the U. S. President, he was forced to speak with Ducky Wucky, the President's rubber ducky. 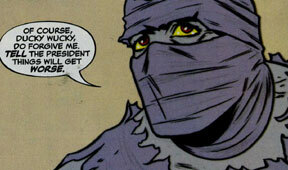 He then returned to his group of deceased superbeings, claiming that he had spoken to the President's "aide-de-camp." Larry (left) and Marlon (right) were the children who discovered the Pitiful One's corpse after he had perished. They opted not to tell anyone of their discovery and years later, Marlon had to move in with Larry and his wife where they watched on television as the Pitiful One attacked the United Nations building.